Businesses on Steinwehr Avenue are not doing well. 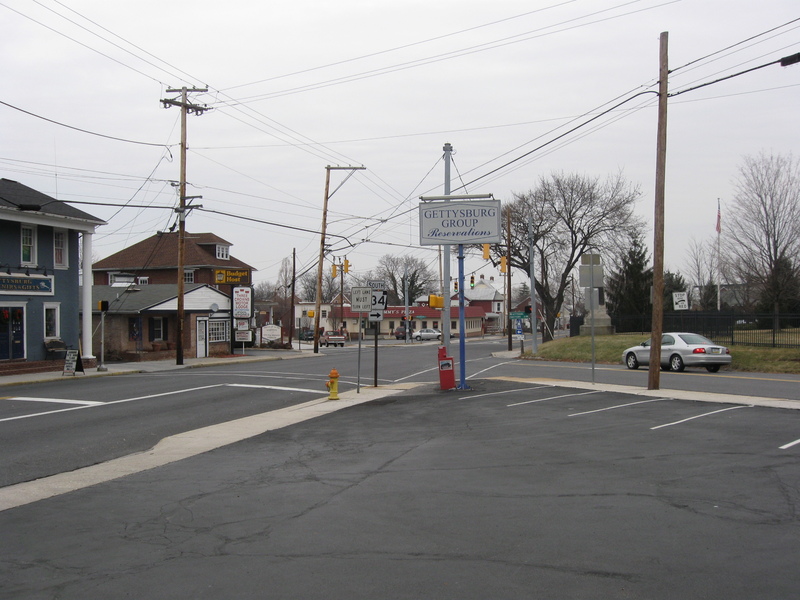 So to revitalize this area a study has proposed a traffic circle here at the intersection of Steinwehr Avenue on the right, and Baltimore Street in the foreground and on the left. Really? This view was taken facing southwest at approximately 1:30 PM on Saturday, January 10, 2009. Steinwehr Avenue is not doing well as a business location. Many people blame the moving of the National Park Service Visitor Center. Others blame the poor economy. 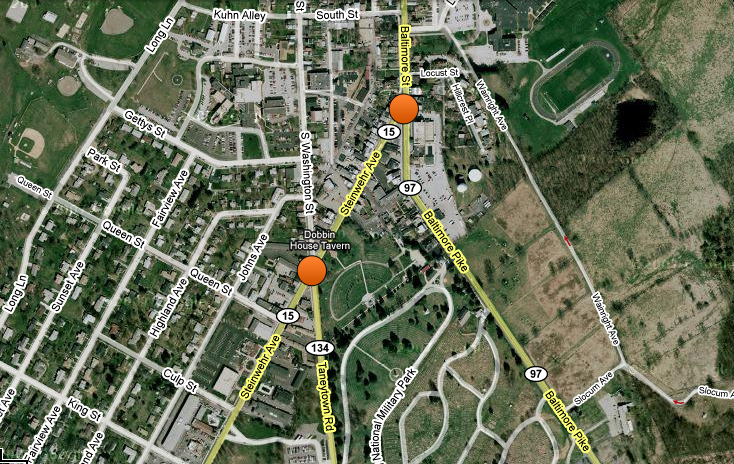 Some blame the outlet mall at the intersection of US 15 Bypass and the Baltimore Pike. Still others blame the fact that some brick and mortar stores just aren’t doing very well in an era of internet commerce. 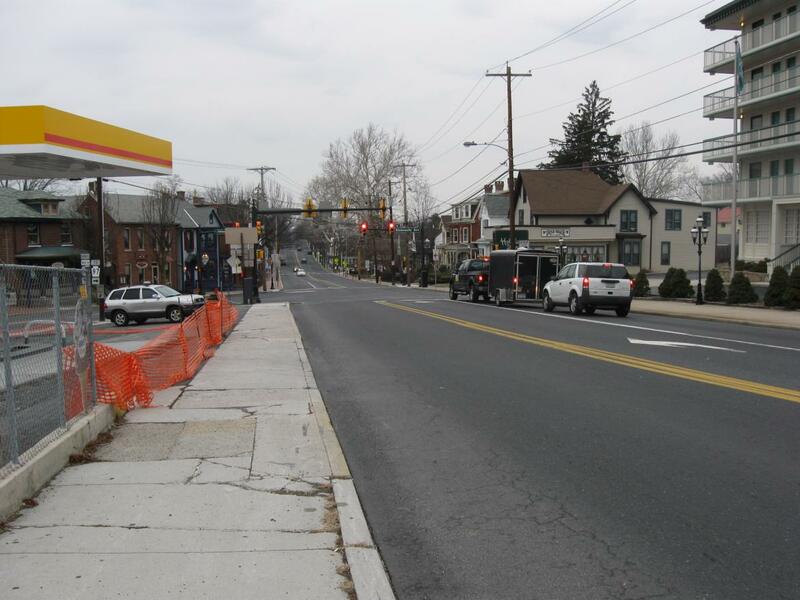 A study was conducted to revitalize Steinwehr Avenue. 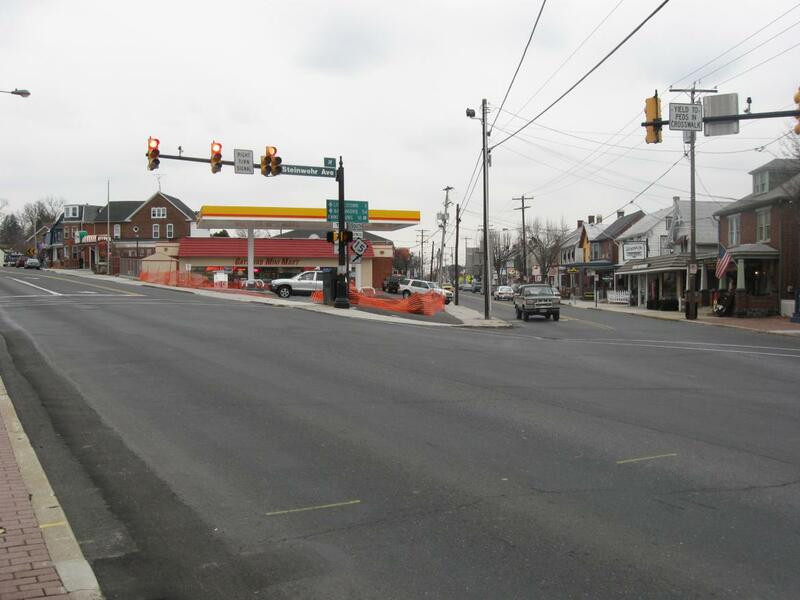 One of the suggestions in the study was to place traffic circles at the intersection of Steinwehr Avenue and the Taneytown Road and Steinwehr Avenue and Baltimore Street. 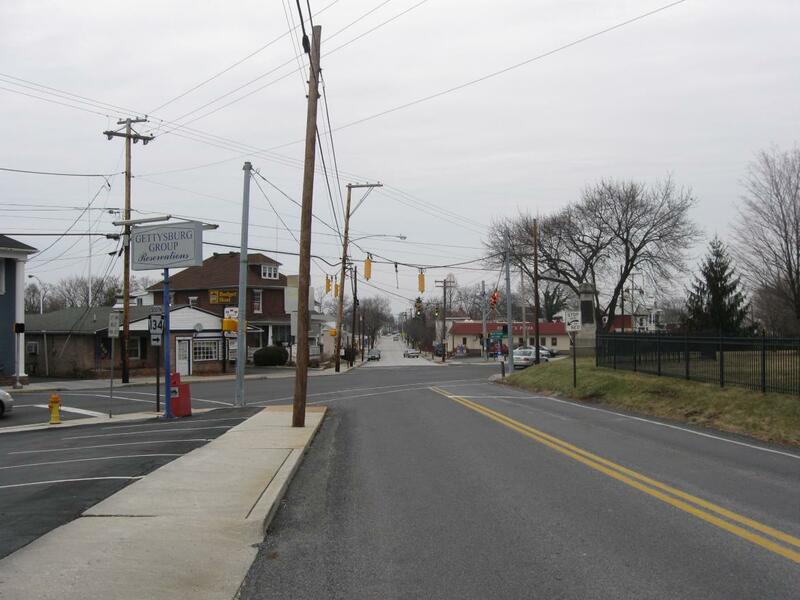 One of the reasons that the Battle of Gettysburg was fought here was that Gettysburg was and is a road intersection. Ten roads come together here. This map was created at approximately 5:00 PM on Saturday, January 10, 2009. 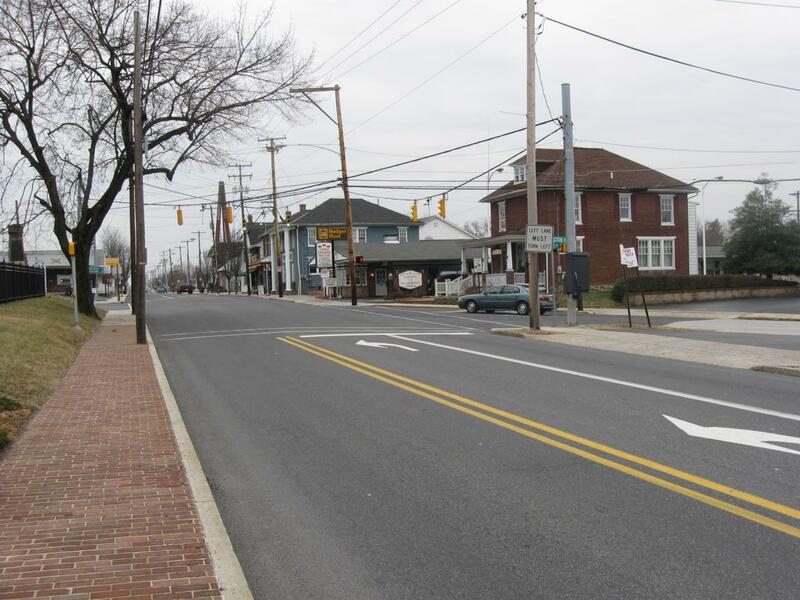 Main Street Gettysburg hired Delta Development Group to come up with a plan to revitalize the area. They would like to make this a “mall looking situation.” We assume that’s because malls are doing so well in other parts of the country. Or maybe they mean a mall like the National Mall in Washington, D.C. where you have a long strip of open green space and trucks parked along the streets selling T-shirts, food, and souvenirs. This view was taken facing northeast at approximately 1:30 PM on Saturday, January 10, 2009. 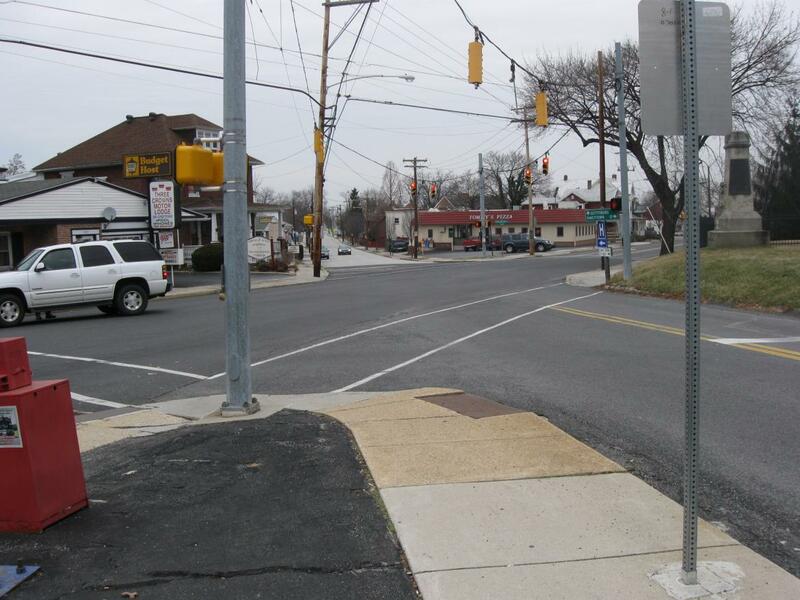 Let’s look at the intersection of Steinwehr Avenue and the Taneytown Road. We are looking northeast down Steinwehr Avenue. 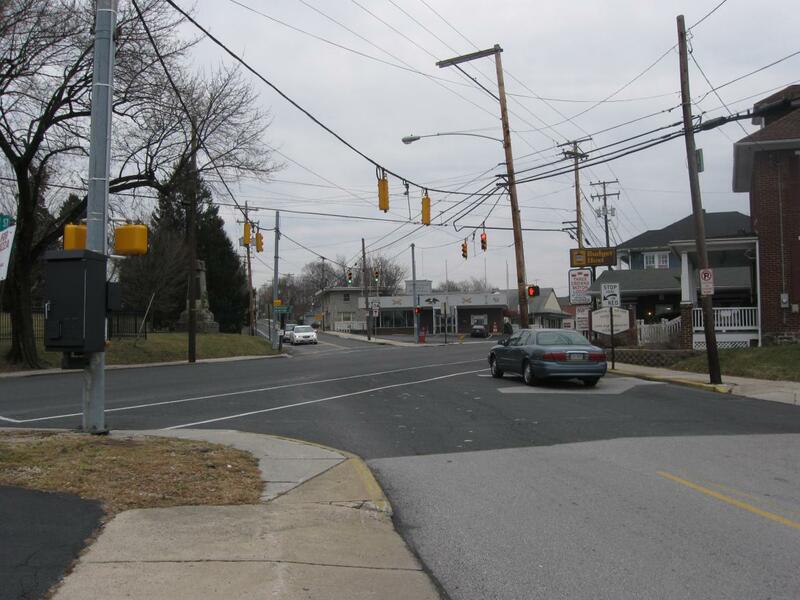 The next set of red lights in the distance is the intersection of Steinwehr Avenue and the Baltimore Pike. The Taneytown Road is on the right in this picture and it becomes Washington Street on the left of the picture. The gold car on the left is starting to drive down Washington Street. This view was taken facing northeast at approximately 1:30 PM on Saturday, January 10, 2009. A closer view of the intersections. 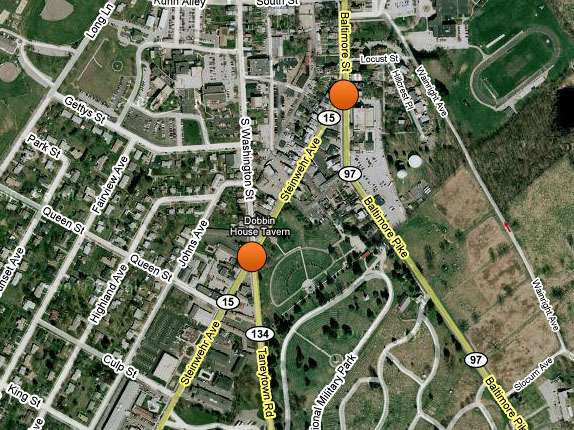 The proposed Baltimore Street intersection is the orange circle on the top right, and the Taneytown Road intersection is the orange circle to the bottom left. 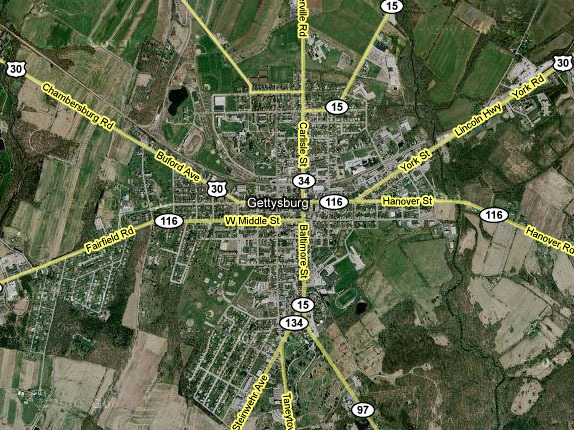 If you’re not from the northeastern United States, and you have an interesting time negotiating Gettysburg’s Circle in the Diamond/Lincoln Square, then you should really love attempting to handle two more. This map was created at approximately 5:00 PM on Saturday, January 10, 2009. 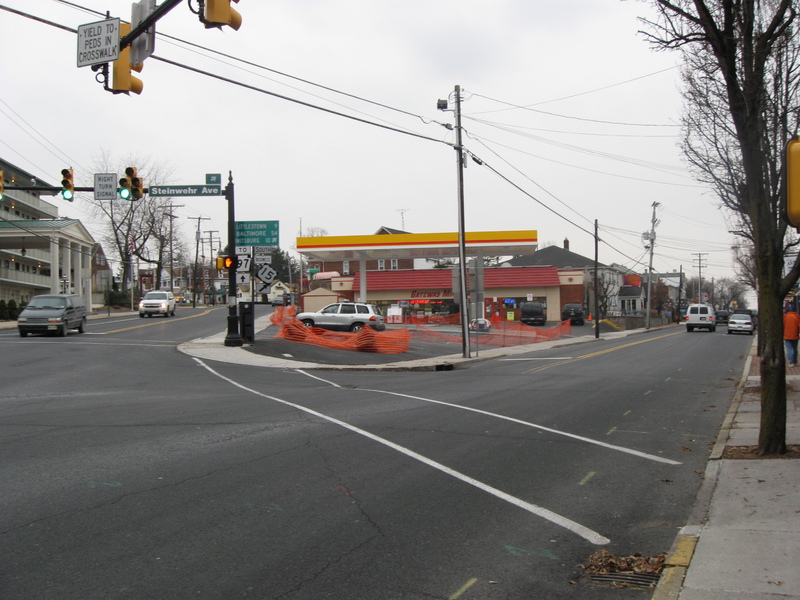 A large traffic circle here should take land from a couple of properties on the corners. 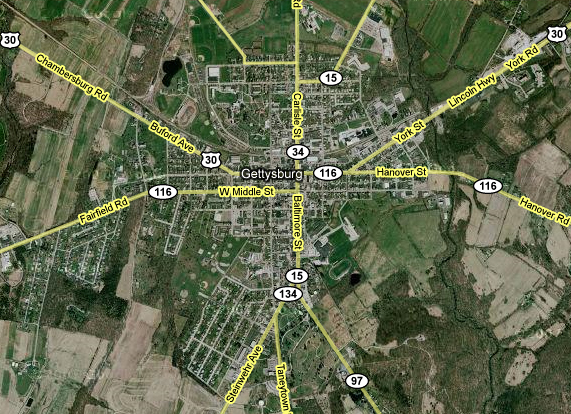 The Gettysburg Group Reservations is the area where we are standing. The National Cemetery annex is on the right. Tommy’s Pizza is the red roofed building in the background. We do like the idea that the proposed “mall” wants to bury the utility lines. Wouldn’t it be nice if they could do that throughout the town? This view was taken facing northeast at approximately 1:30 PM on Saturday, January 10, 2009. 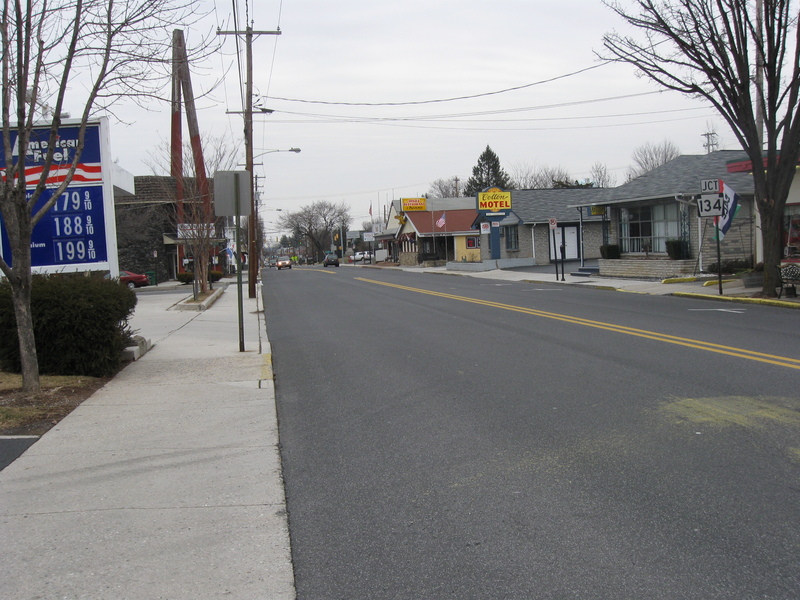 This view shows us looking down historic Cemetery Hill as the Union Army’s Eleventh Corps did when they marched down through this intersection as they made their way through the town to the battlefield north of the Borough. One of the problems with this intersection is that buses have a difficult time making a left turn here onto Steinwehr Avenue. If the buses had someone on board who knew what they were doing, they could have made a left farther up Cemetery Hill through the old Cyclorama parking lot. So now somebody wants to cut into Cemetery Hill to make a large traffic circle that buses and, therefore tractor-trailers can negotiate. Can we imagine how big the circle would have to be to allow that to happen? This view was taken facing southwest at approximately 1:30 PM on Saturday, January 10, 2009. This was an area of constant skirmishing between Union troops (commanded by Adolph von Steinwehr) occupying Cemetery Hill on the left, and the Confederates (commanded by William Dorsey Pender) closer to the town on the right. 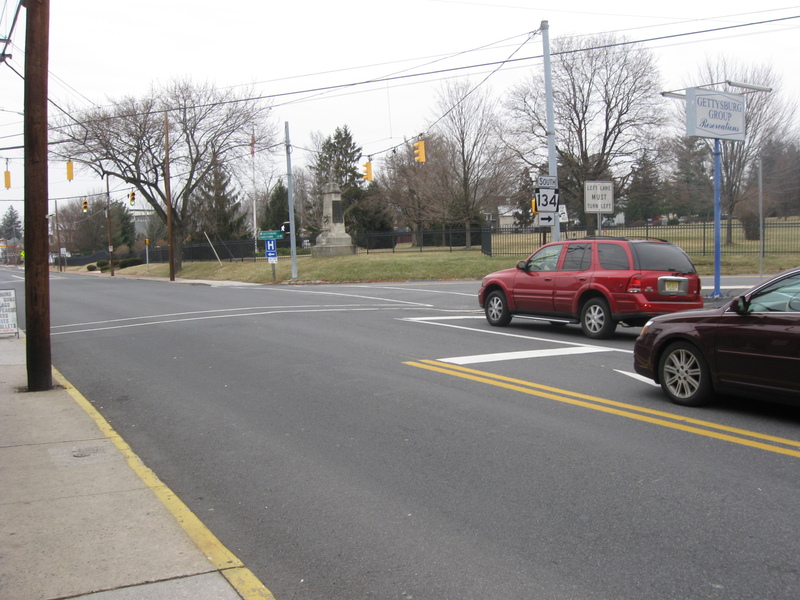 When President Lincoln rode to the Soldiers’ National Cemetery to give his Gettysburg Address, he took a left at this intersection to enter the cemetery near what is now the Taneytown Road entrance. The rest of the crowd entered the cemetery near the current Baltimore Street entrance. This view was taken facing southwest at approximately 1:30 PM on Saturday, January 10, 2009. We are standing near Washington Street looking up Cemetery Hill along the Taneytown Road. 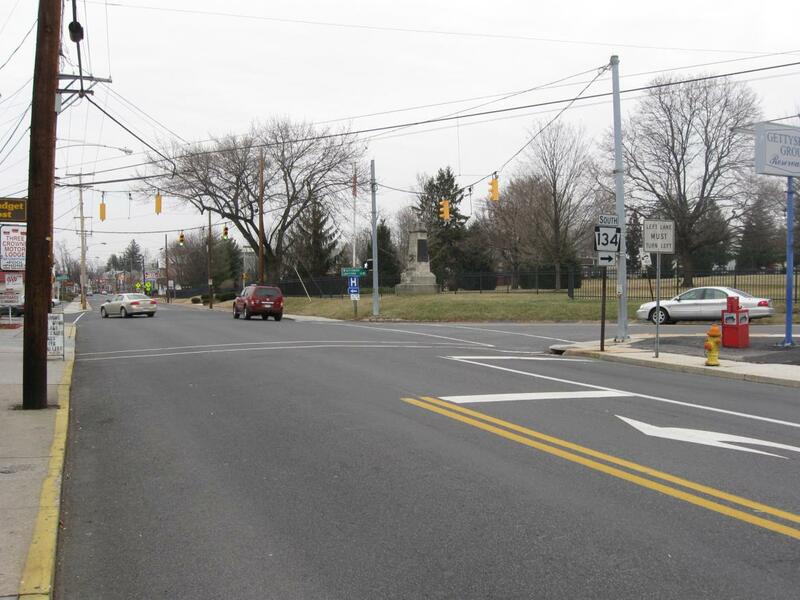 The body of Major-General John Reynolds, which had been placed in a wooden coffin at the George George House was then taken from Steinwehr Avenue over Cemetery Hill on the Taneytown Road at this intersection on July 1, 1863. This view was taken facing south at approximately 1:30 PM on Saturday, January 10, 2009. By the way, the monument in the background by the National Cemetery annex is to the 55th Ohio Infantry Regiment. What will happen to it? As anyone knows who has seen our previous posts on flank markers, the National Park Service does not move monuments. This view was taken facing southeast at approximately 1:30 PM on Saturday, January 10, 2009. Here’s the intersection of Baltimore Street on the left and Steinwehr Avenue on the right. 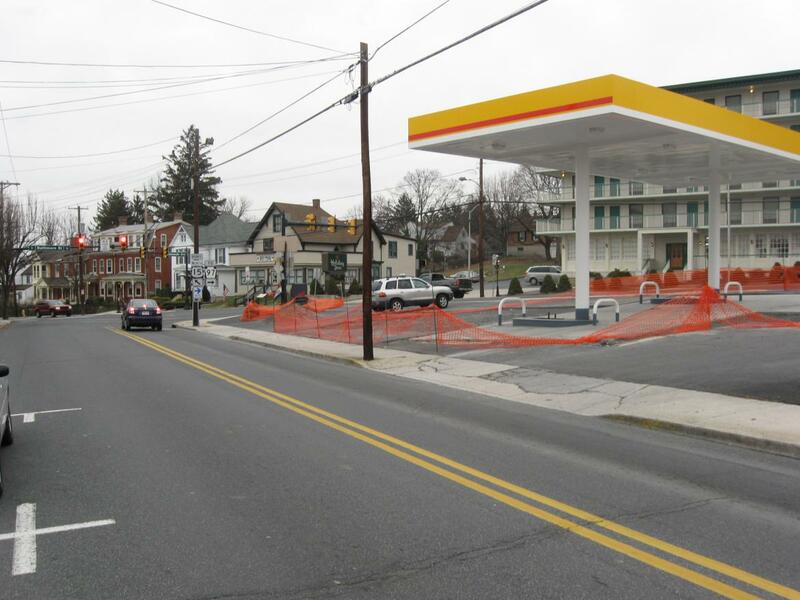 To put a positive “spin” on the “circle,” the proposed construction would not only cut into Cemetery Hill, it would take out the gas pumps and the pretty yellow overhang at the Gateway Mini Mart. This view was taken facing south at approximately 1:30 PM on Saturday, January 10, 2009. Again, the problem here is that buses (and tractor-trailers) cannot make a left turn onto Steinwehr Avenue as this white SUV is doing. They come close to taking out the buildings near Dale Gallon’s Art Gallery (white building). This view was taken facing northwest at approximately 1:30 PM on Saturday, January 10, 2009. On July 1, 1863, much of the Army of the Potomac retreated towards this camera position along Baltimore Street. 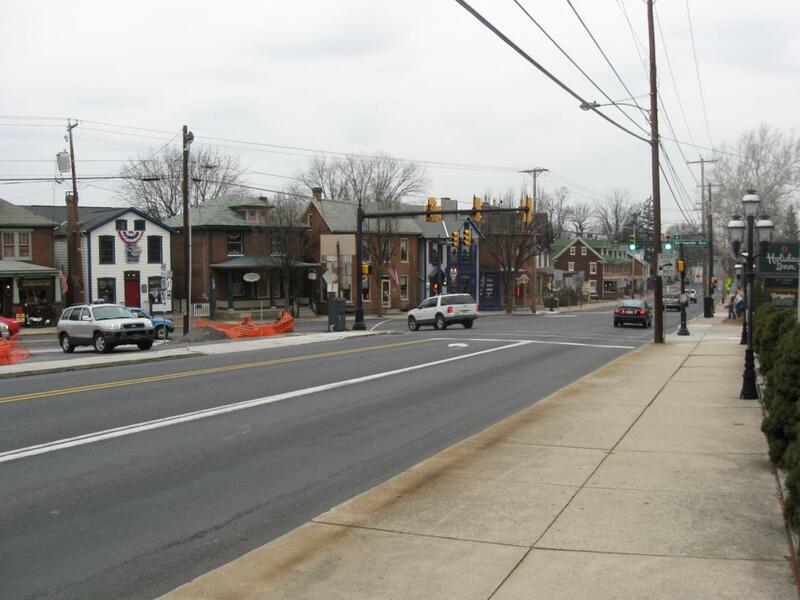 On November 19, 1863, President Lincoln came down Baltimore Street towards the camera position before making a left (his right) on the Emmitsburg Road (Steinwehr Avenue). There was constant skirmishing here over the three days of battle. This view was taken facing north at approximately 1:30 PM on Saturday, January 10, 2009. Yep, a big circle here should take care of a lot of non-historic structures. 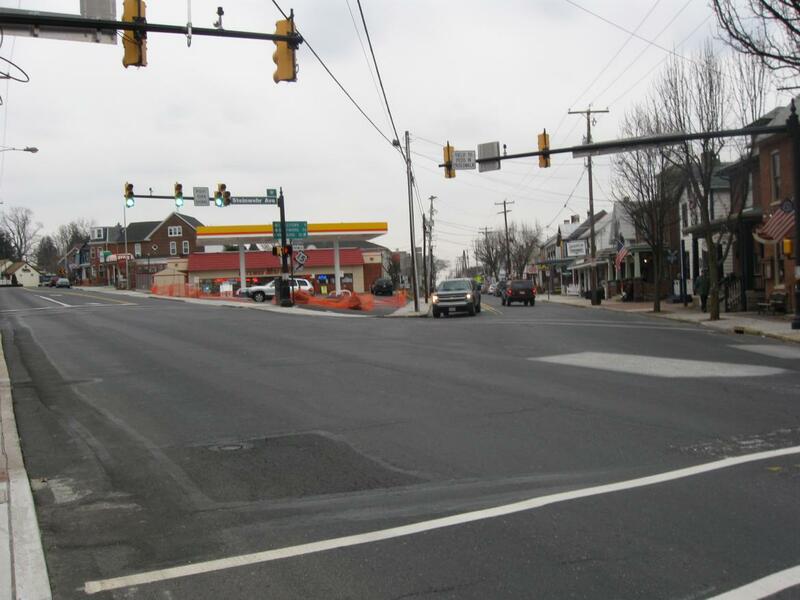 The outgoing President of Main Street Gettysburg said that a developer needs to spend $10 million to $20 million to revitalize Steinwehr Avenue. This view was taken facing northeast at approximately 1:30 PM on Saturday, January 10, 2009. So Steinwehr Avenue is “dying,” and downtown Gettysburg is “dying.” In our simple view of looking at things, wouldn’t it make sense to spend $10 million to $20 million on downtown Gettysburg and have the “good” business on Steinwehr move into empty historic structures downtown? This view was taken facing south at approximately 4:15 PM on Friday, September 11, 2008. Some would rather have millions of dollars spent on preservation/returning this area closer to its 1860s appearance. We know we will again hear from people who say to us, “people have to live and work and pay taxes in Gettysburg.” So do we. We just think that more preservation that shows our uniqueness will bring in more money. Not non-historic structures that make us look like every other place. This view was taken facing southeast at approximately 4:15 PM on Saturday, May 31, 2008. 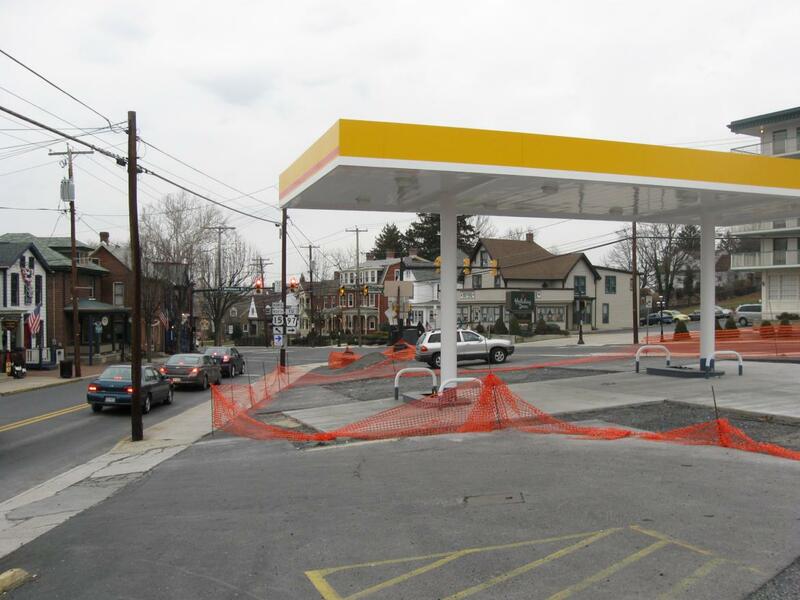 Even if you disagree with the basic desire to see Cemetery Hill free of non-1860s development, who really thinks that big traffic circles in these locations are going to help the businesses on Steinwehr Avenue? This view was taken facing northeast at approximately 7:30 AM on Monday, October 13, 2008.